From street vendors and break-dancers to protest rallies and activism, the lively area known as Union Park stretches from 14th Street to 17th Street, and from Union Square East (Fourth Avenue/Park Avenue South) to University Place. Most of the action is located within Union Square Park, a former burial ground that has since transitioned into a bustling city park. Now a National Historic Landmark, Union Square Park is home to an eclectic collection of dog walkers, community events, festivals, and the wildly popular Greenmarket featuring fresh produce, crafts, artisan foods, homemade goods. 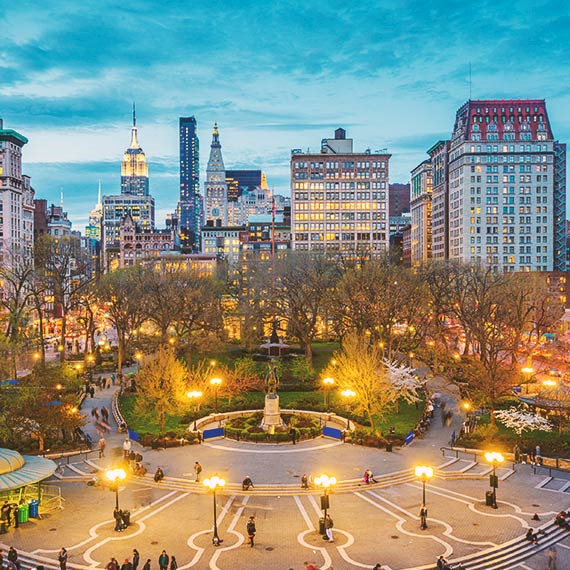 Union Square is the perfect place to enjoy a picnic lunch, sightsee, shop at one of the city's oldest bookstores, and take in the city culture. Wednesdays, Fridays & Saturdays 8 am - 6 pm. When is the Union Square Farmer’s Market? The Greenmarket at Union Square Park is open every Monday, Wednesday, Friday, and Saturday from 8:00 a.m. to 6:00 p.m. It features vendors from all over the tri-state region selling everything from fresh produce, flowers, seafood, meats, cheese, and microgreens, as well as crafts, artisan foods, and homemade goods. Get fresh juices, herbs, plants, and a sandwich while strolling around this urban park. What is around Union Square? The small neighborhood of Union Square is comprised of lively shops, cafes, historic music venues, and department stores. Stop by the 90-year old Strand Bookstore for rare new and used books. Grab a bite at ABC Kitchen. Check out a local band or big-name concert at storied venues like Webster Hall and Irving Plaza, all within a few city blocks.